ICY DOCK EZConvert Pro MB982SPR-2S R1 is a full metal dual drive 2.5” SATA HDD / SSD to 3.5" SATA HDD converter with built-in RAID 0 (FAST), RAID 1 (SAFE), JBOD and BIG functions. The MB982SPR-2S R1 converts 2 x 2.5" SATA hard drives or SSD from 5 – 9.5mm drive height into an exact same dimension, screw holes and connector locations of 3.5" SATA hard drive. That’s been said, with EZConvert Pro MB982SPR-2S R1, you can easily add a 2.5” HDD / SSD RAID array anywhere a 3.5” SATA drive is used such as internal 3.5" drive bay, custom build 3.5" HDD slot or pre-existing 3.5" hot-swappable trays, without needing to add a RAID controller card and 2.5" drive mounting kit. The MB982SPR-2S R1 has equipped with SATA 3 RAID chipset for maximum performance and it is build by full metal construction for best drive stability. The MB982SPR-2S R1’s patented tool-less drive installation design makes drive maintenance easy and cost effective. To add or replace 2.5” drive(s), simply open the top cover of EZConvert and put 2.5" HDD(s) / SSD(s) in the converter and close the top cover and voila! You are ready to go. The EZConvert Pro MB982SPR-2S R1 is designed to maximize the flexibility of 3.5" drive space with minimum downtime and costs. It is suggested for applications that require OS drive redundancy or high IOPS values such as medical & military systems, government agencies computers, Industrial PCs, SMB workstations, VM workstations, POS systems, SFF & mobile systems, automation systems and embedded systems. The EZConvert Pro MB982SPR-2S R1 is a self contained hardware RAID 2.5" to 3.5" drive converter that gives you the flexibility to choose between RAID 0 (FAST), RAID 1 (SAFE), BIG and JBOD modes. With its built-in high performance SATA 3 RAID chipset, the converter operates independently of your system with its own processor and memory to run the RAID applications, offering the next level reliability comparing to software RAID. Software RAID can be infected by viruses and cause the RAID table to be corrupted, result in permanent data loss from the drives. *Note: The avaliable data capacity in a RAID 0/1 array is limited to the drive with least amount of data capacity. we recommend to use identical drive for RAID 0/1 setup. With the standalone RAID function you can easily add 2.5” HDD / SSD RAID array into anywhere a 3.5” SATA drive is used via a single SATA connection without the need of an additional RAID controller card or drive mounting kit. For example, you can quickly replace your 2012 Mac Pro’s 3.5” hard disk drive with 2 x 2.5” drives in RAID 0 array for faster transfer speed, or create 2 x 2.5” drives in RAID 1 array to replace the 3.5” SATA HDD in your pre-existing POS system to prevent a downed system caused by unexpected drive failure. 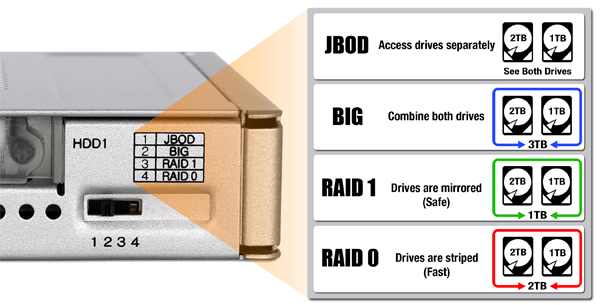 The JBOD mode allows you to see two individual drives (requires SATA port-multiple on the host end to detect both drives), and BIG mode provides maximum storage capacity into a single point, by combining two hard drives storage capacity sizes into a single large storage volume. The variety of RAID configurations that MB982SPR-2S R1 offer maximize uses for your 3.5” hard drive space, the choice is yours! The EZConvert Pro MB982SPR-2S R1 converts up to two standard 2.5" SATA HDD / SSD into an exact 3.5" SATA hard drive form factor. Since it has exact same dimension, screw holes and connector locations of 3.5" SATA hard drive, it can fit into any 3.5" SAS or SATA hard drive spaces without any modifications to the system structure. To ensure hassle-free drive installation, the EZConvert Pro MB982SPR-2S uses tool-less drive installation design which unitizes a number of components to accommodate all type of 2.5" SATA HDD / SSD drive height from 5mm to 9.5mm. To install 2.5" HDD / SSD is easy, simply open the top cover of the converter and put 2.5" HDD / SSD in the converter and close the top cover. The self locking mechanism locks in the drive and ensures drives are securely connected once the top cover is closed. The varieties of applications that use 3.5” SATA hard drive are endless, some of which may include: personal desktop computer, Mac system, gaming rig, network attached storage, surveillance system, POS system, video rendering workstation, or enterprise data servers. Being able to reap the benefits of 2.5” SATA HDD / SSD but still meet the requirements of the 3.5” form factor can be very rewarding. For example, Solid-State Drives provide faster data transfer speeds and lower temperature output and can be a beneficial upgrade in many systems. With MB982SPR-2S R1, you can convert 2 x 2.5” SATA SSD or notebook drive into a 3.5” SATA drive hassle-free. Single SATA 15 pin power to power entire device & single SATA data connector to operate. how is this product different from MB992SKR-B..?? Is it just a matter of SATA2 versus SATA3 capability? The electronics are pretty much the same, but the form factor of the enclosure is different. MB982SPR-2S R1 mimics a 3.5" drive - so it can be inserted everywhere where a 3.5" SATA drive fits. MB992SKR-B is a mobile rack for the external 3.5" bay of a computer case (former floppy bay). So with this model the front is accessible from the outside and you can swap drives without having to open the case. MB992SKR-B also has an individual RAID 1 Rebuild indicator which allows user to check the real-time drive status without accidentally pulling the drive out during the rebuild process. Both MB992SKR-B and MB982SPR-2S R1 support SATA III.